JUST ADD YOUR BOOT FOR BIG SPEED!! The revolutionary Xenan DVA frame utilizes three 100mm wheels for big speed. Even though three of the wheels are 100mm in diameter the DVA frame handles like a typical five wheel 80mm setup. The ground clearance over the 80mm second wheel is no greater than standard frames while the wasted space under the boot is filled to capacity by the larger wheels. CNC milled in Denver, Colorado USA from a solid block of aluminum makes for an incredibly stiff frame. Stainless steel bearing contacts are more precise and will not wear or become damaged from repeated installations of the wheels. The axle bore is more precise and true when made out of individually milled stainless steel pieces. Longer axles are used so that 5 full turns of the single piece axle are engaged when the axle is fully seated, axle spinout is never an issue. All axles are inserted from the right side so that they "spin tighter" during skating. Arched bridge design creates maximum strength and reduced weight. The Xenan DVA weighs in at 243 grams without axles. Would you like to skate faster and do less maintenance? There are many positive reasons to use larger wheels. Simple mathematical models show that a larger diameter wheel has less rolling resistance. Larger wheels turn fewer revolutions to travel the same distance as a smaller wheel. Less revolutions = lower rpm = reduced bearing friction. A larger wheel rolls over debris more easily and maintains its forward momentum. At speed the gyroscopic forces of large wheels produce added stability, no high speed wobbles. 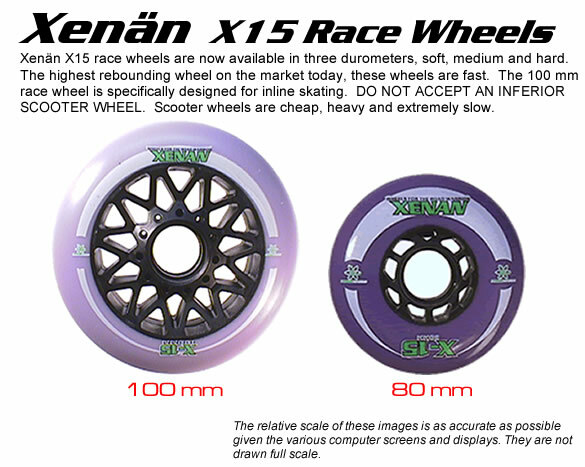 Xenan X15 racing wheels are now available in 80mm and 100mm sizes. Formulated from a new proprietary urethane, X15 race wheels are rocket sleds for your feet. 100m race wheels offer a faster roll, fewer bearings to clean and a more comfortable ride. Frame designs that use different sized wheels must rely on the wheel manufacturer to meet production specifications. If the wheel diameters are not precisely 100mm and 80mm all four wheels will not touch the ground. The speed radius of the 80mm wheel must exactly match the speed radius of the 100mm wheel so that when the skate is leaned on edge all of the wheels remain in contact with the ground. 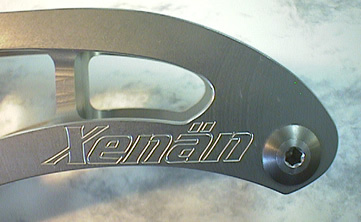 Xenan X15's have conquered this problem and are made specifically for Xenan hybrid frame designs. Perfectly mated the Xenan X15's will deliver outstanding push every time. The placement of the 80mm wheel under the ball of the foot is the key element of the Xenan hybrid design. This allows the footbed of the boot to stay low and close to the ground. The Xenan DVA is no higher off the ground than all other standard bolt on frames yet uses 100mm wheels. What's this about rebound? And what's in it for me? In a nutshell, rebound is the measurement of energy returned. Perfect energy return would equal 100% rebound, a physical impossibility. The closer that we get to the ideal, the less energy is being wasted, this means more speed because more of the stored energy is being released out of the wheel during rebound. The Xenan X15 wheel is the highest rebounding wheel in the market today. the X15 has a smooth, silky ride and tons of traction, characteristics deemed incompatible with speed. Yet here it is. The X15 ride has to be experienced, it is impossible to describe. The chemists who developed this incredible urethane are passionate about wheels, their experience second to none and the results speak for themselves. If you love to skate you owe it to yourself to experience the X15 rocket ride. Review of this frame (read on).